Efficient and reliable operation is an important key to a successful business. And to help you run your retail or hospitality business more smoothly, the UP-600 and UP-700 POS terminals are packed with a wealth of advanced features and convenient functions. These include a multi-line operator display for easy operation, and Ethernet in-line system for efficient sales data management, accurate bar code entry, and Menu/Condiment/Combo PLUs that can be registered quickly and easily. So give your business the streamlined operation it needs --- give it a Sharp UP-600 or UP-700 POS terminal. The sleek, modern design of the UP-600/700 blends easily into any interior and can add a touch of elegance to your shop or restaurant. The back-lit LCD operator panel shows 8 lines of information at a time, such as items, prices and other relevant data, for quick confirmation even in low-light environments. The display can be tilted to an angle for better viewing. Detailed receipts with information such as sales items, the cashier's name and messages, are silently printed out on a 58 mm-wide paper at a speedy rate of approx. 17 lines per second. Graphic logos can be printed out as well, helping to further promote your business. If during the sales transaction an item comes up as unregistered, you can register it on the spot by simply scanning the bar code and entering the price and department number. The product will be instantly added to the master product file, allowing you to run your business even more efficiently. The Ethernet interface board* lets you create an in-house network by connecting "satellite" terminals to a "master" UP-600/700. Through this high-speed (10 Mbps) in-line system, the master terminal can collect and process sales data from the satellite terminals as well as send out preset data. 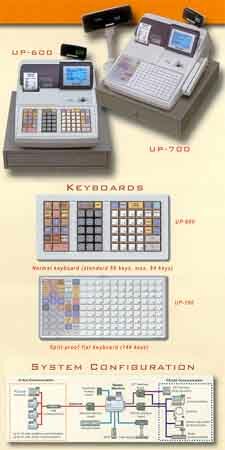 The UP-700 lets you customize the arrangement of the keys any way you like to accommodate your specific business and application requirements. If you are upgrading from an older machine, you can arrange the new keyboard to be consistent with the old one, reducing both training time and errors. You can also switch between up to three PLU menus -- a convenient feature for restaurants that change their menus or prices depending on the time of day. This mode allows cashiers to practice operating the UP-600/700 without affecting actual sales figures. PLU - Prints sales data details, stock management, zero sales for each PLU, etc.